The outside weather is really nice lately and it draws me outside rather than to my desk. Nevertheless, I'm not idle and I'm working hard on some news for the weekend. I got inspired by nature and I have flowers for you. There are never enough flowers and I still need more and more. I like some versatile ones the most as you can put them together any way you want. I'm talking about these flowers, which you will find in the e-shop on Sunday. 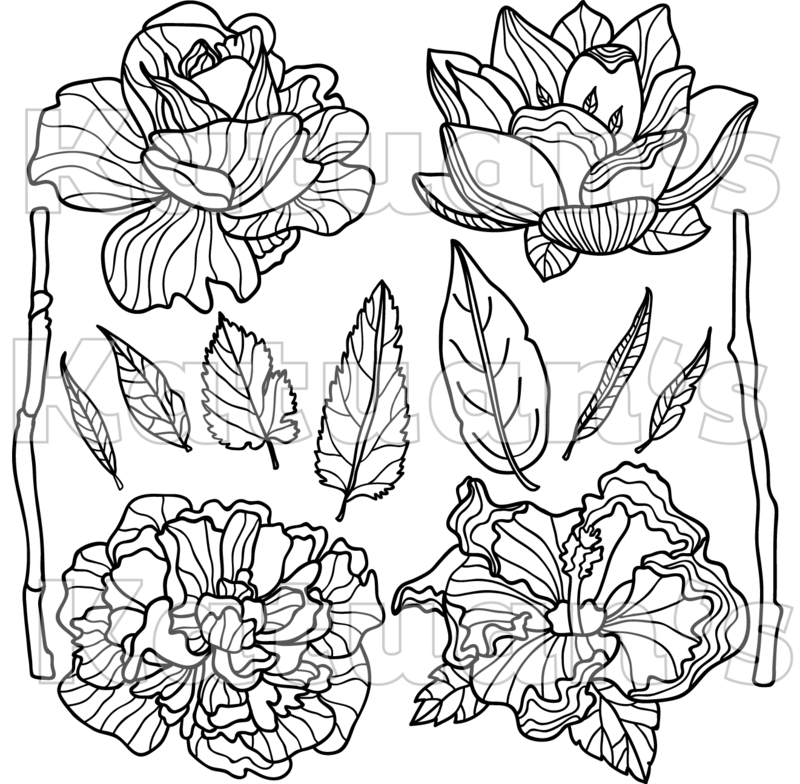 Four flowers, two stems and seven leaves. That's pretty versatile, don't you think? 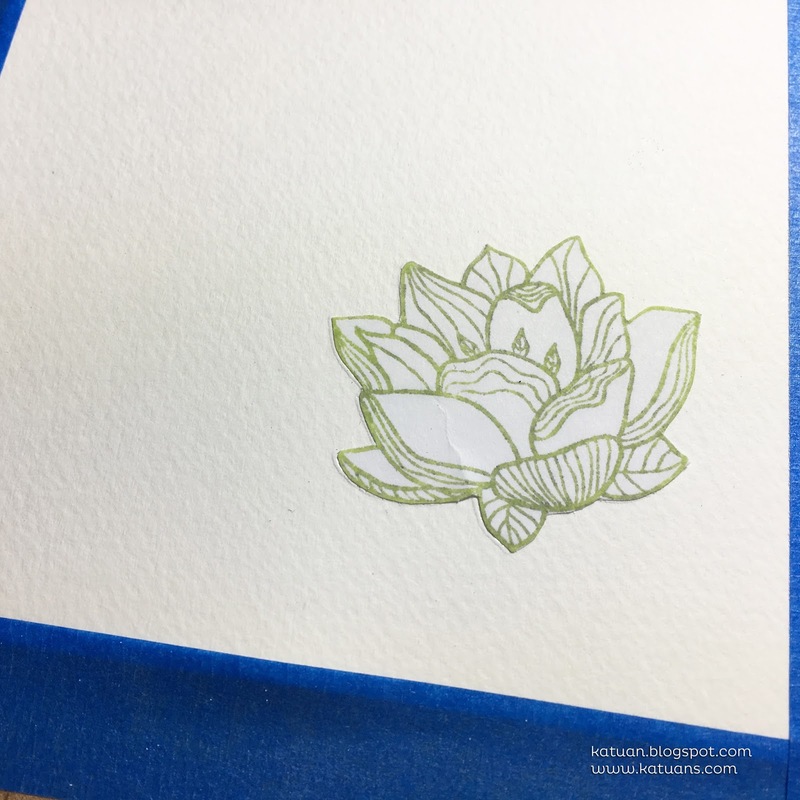 And since I like to peak into the makings of greeting cards and get inspired, I have some small instructions and inspiration for you. 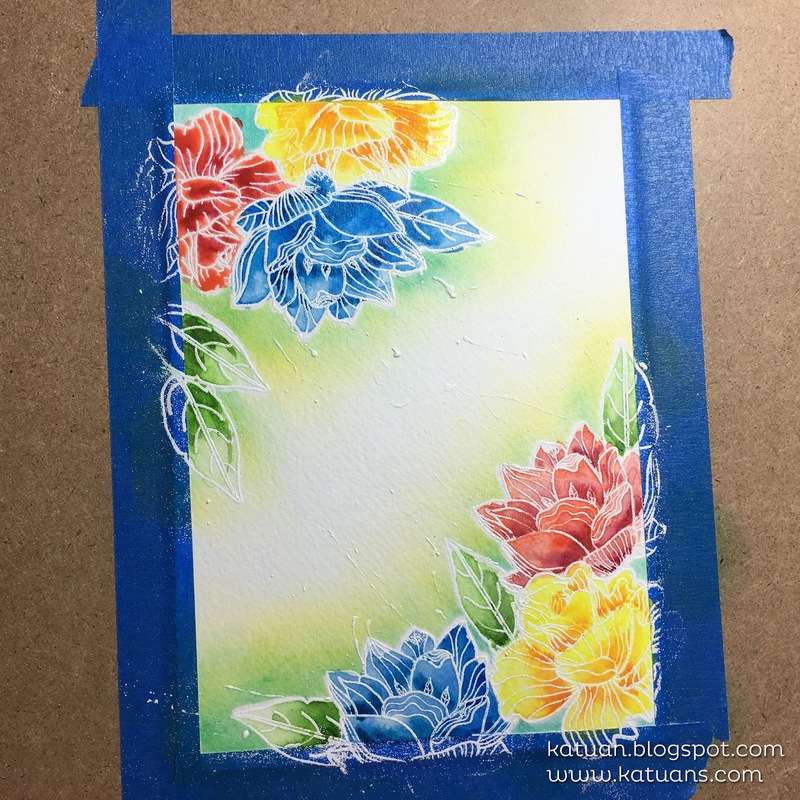 I used the biggest leaf from the set and the first two flowers. 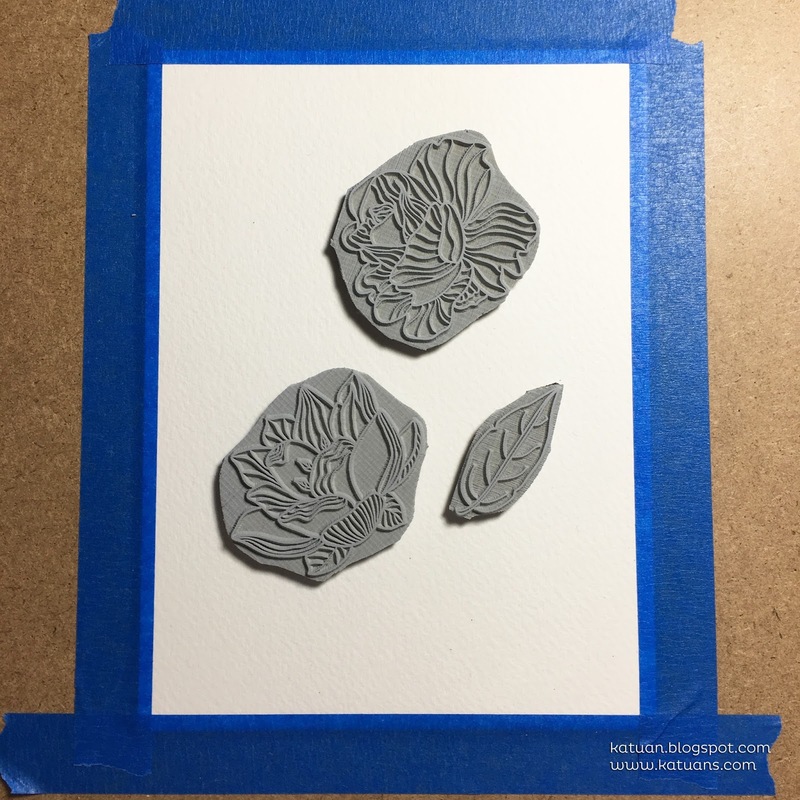 I pasted the back of the whole stamp using a cling foam and I cut out only what I needed - for now. 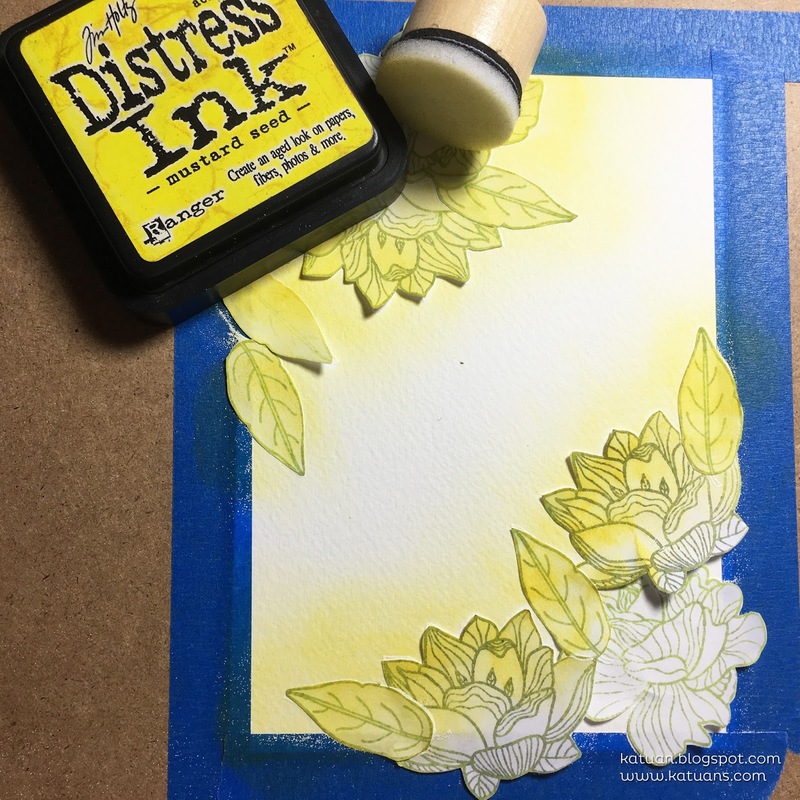 I glued an aquarelle paper on a desk using masking tapes even though it isn't necessary. It caused me more trouble than it had benefits, but I still didn't know exactly how am I going to create it. 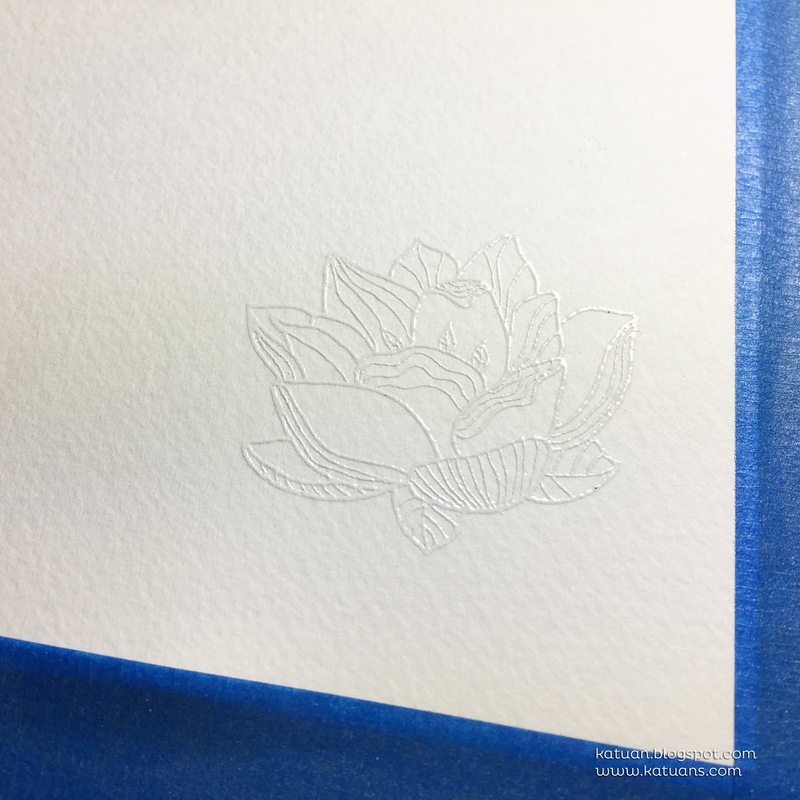 And I started slowly to emboss the flowers with a white embossing powder. 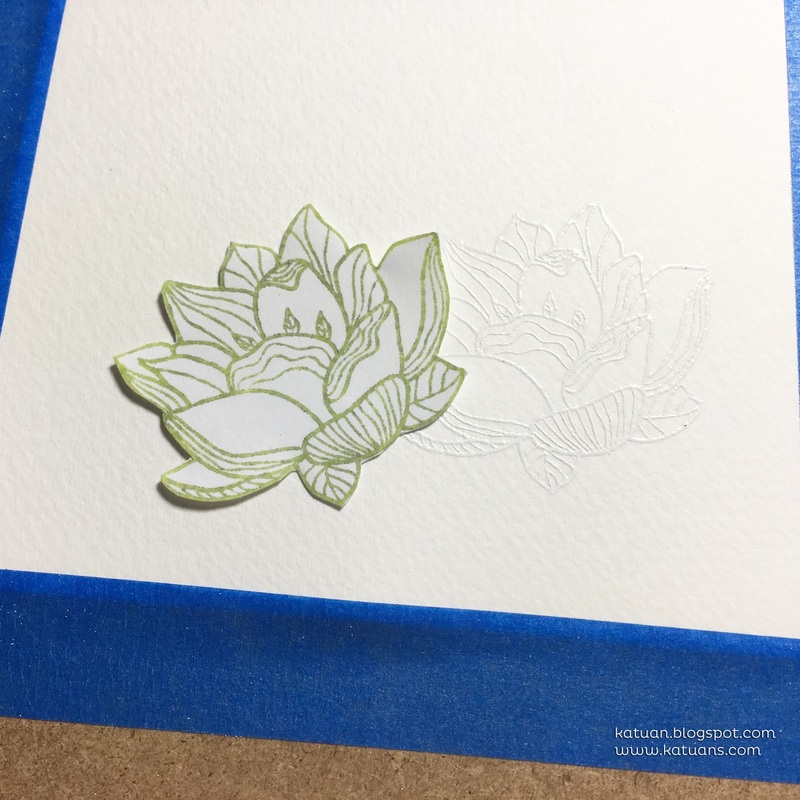 As I embossed one flower, I stamped the same imprint on a masking paper. It's a semitransparent and only a little bit sticky paper. It is supposed to mask the stamp underneath it. And then I glued it over the stamp. 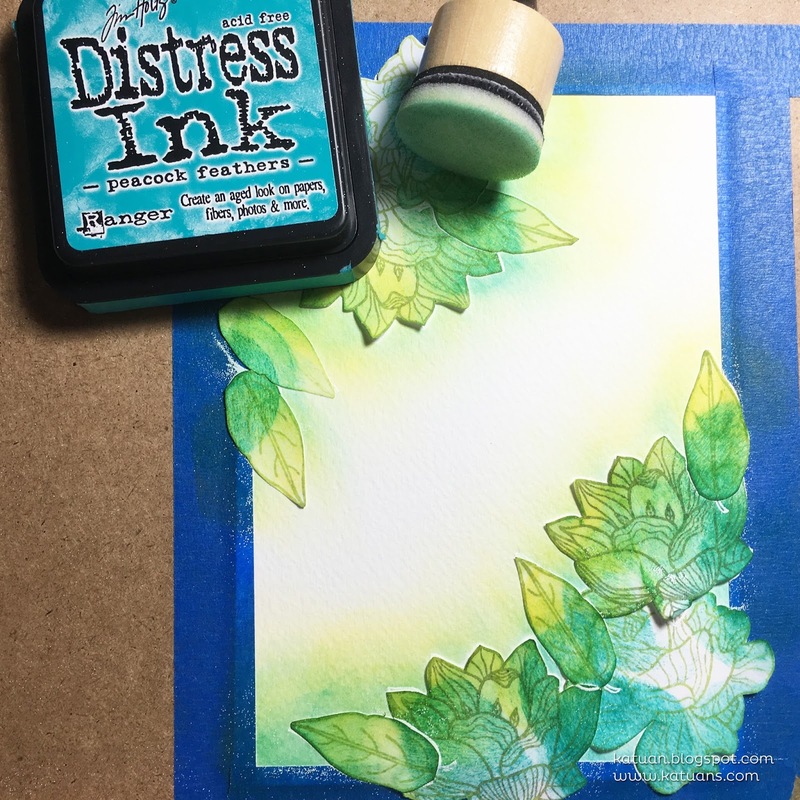 Thanks to this, I can stamp and emboss as much as I want and it will just beautifully add layers and I won't have any problems with the stamps overlapping. 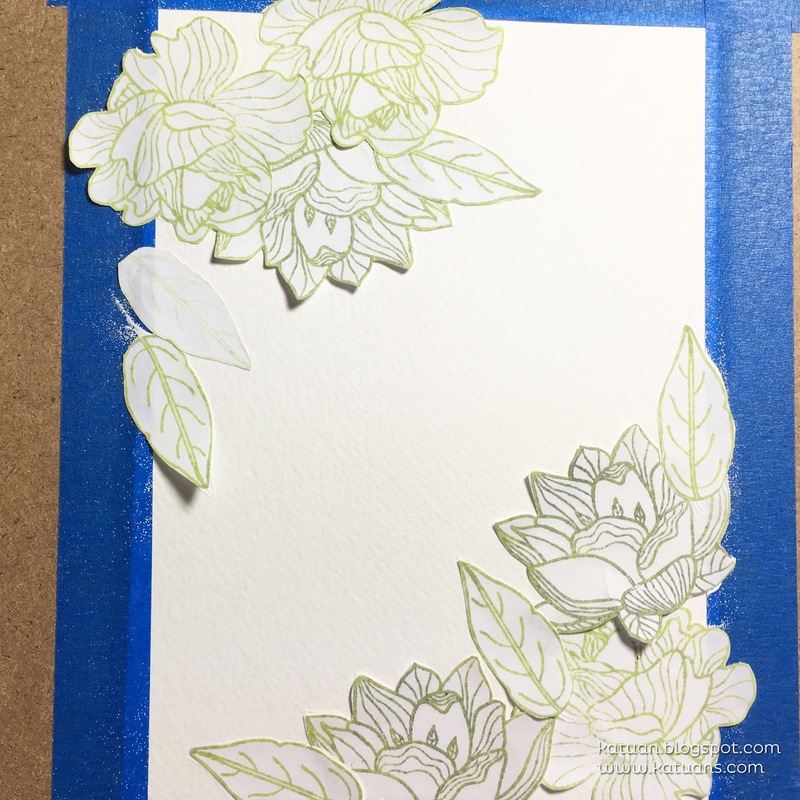 The card looked something like this at the end of my embossing work. I also covered the individual leaves. 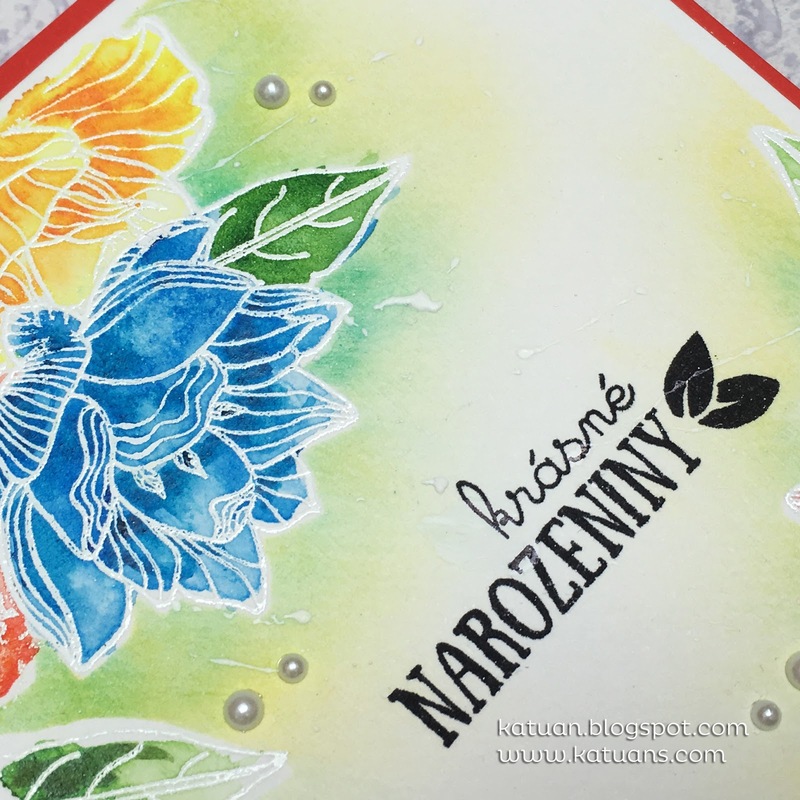 By using a stippling pillow and a yellow Distress color I applied the color to the edges of the flower clusters. I added a little bit of turquoise color to it. In this phase you can also use gesso, sprays, and so on. When you're ready, you can simply remove the masking paper. 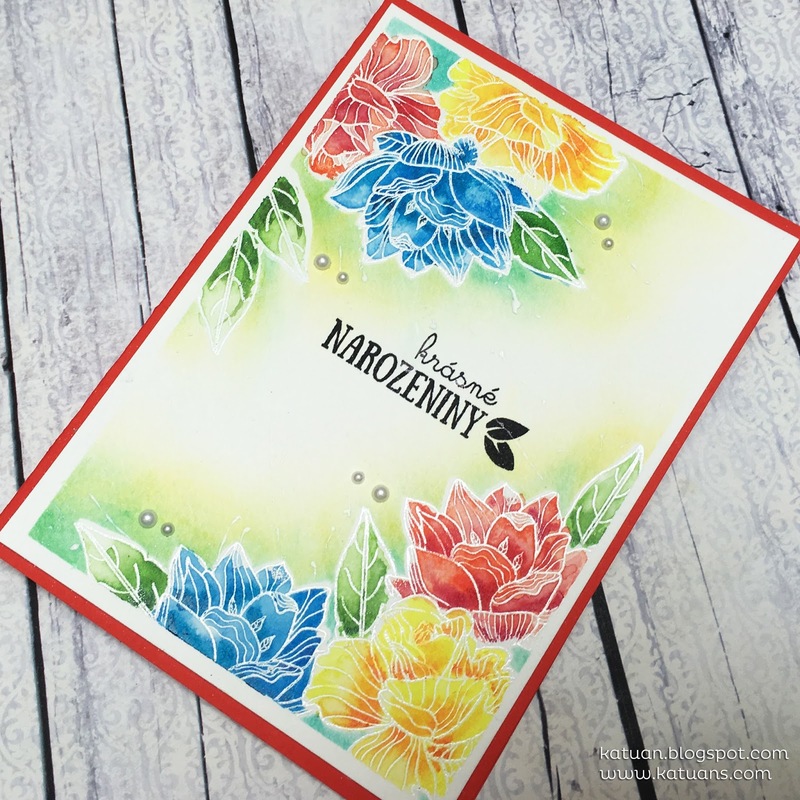 I colored in the flowers using aquarelle colors and I stamped the new spring stamp into the middle. Then I added some self-adhesive beads to the card and I glued it on to a colorful base - and it's all done. Dokonalé! 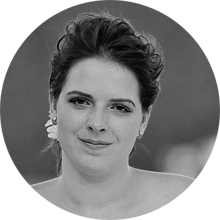 Tobě to prostě jde a já slintám. Opravdu špica!